This modern and innovative work space in the heart of Wickede, Dortmund, provides professionals with a functional and comfortable work space where you and your business can thrive. Designed to bright, spacious and refreshing, this space will promote your productivity and excellent infrastructure ensures you can work efficiently. The location is ideal and surrounded by public transport links including the U-Bahn and S-Bahn. This new co-working and event space is in the middle of Dortmund"s city centre, 1.5km from Dortmund Hauptbahnhof, and is distributed over an area of 1,500m². Common areas are available for members to network and weekly events are provided, while the local area is full of restaurants and bars. In addition, commutes to this centre will always be pleasant- there are historical monuments to observe on your way to work! Situated right in the city centre of Dortmund, just beside the Stadtgarten, this business space offers a range of flexible and modern working solutions to professionals. Offices are fully equipped with all you need and allow access to meeting/seminar rooms. There is high speed internet throughout to allow for great connectivity at all times. 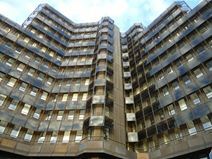 The centre is ideally located with plenty of public transport links nearby. Found in a top class location right beside Dortmund port, this business centre is easily accessed using both public transport options and by road. The centre offers beautifully decorated offices which come fully equipped and ready to use. With plenty of space for the creative, this is a great location for all professionals. The centre is just around the corner from Hafen U-Bahn and bus stops. Nearby you will also find several eateries. Found in the heart of Dortmund right beside the Dortmund University Campus, this business space offers convenient and modern office solutions. The building offers coworking solutions and private offices, with the added bonus of access to meeting and seminar rooms. You can stay connected throughout the building with high speed internet and benefit from great infrastructure. The nearest underground station is only 13-minutes away. Located in the heart of Dortmund, in one of the most dynamic business areas of the city, these professional office spaces benefit from a wonderful view over the city, from parking facilities and on-site bistro. Shopping centres, restaurants and numerous facilities are situated in this area, which is well served by public transport and excellently connected to the airport and the major motorway junctions.